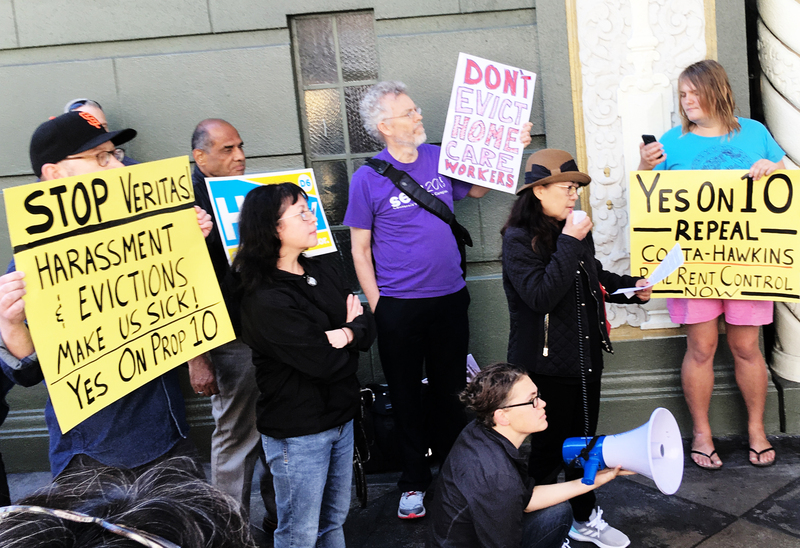 Tenants and housing justice advocates from across San Francisco rallied outside of a Veritas Investments building to demand the Repeal of Costa Hawkins and an end to harassment and evictions at the hands of speculator landlords like Yat-Pang Au, CEO of Veritas Investments. 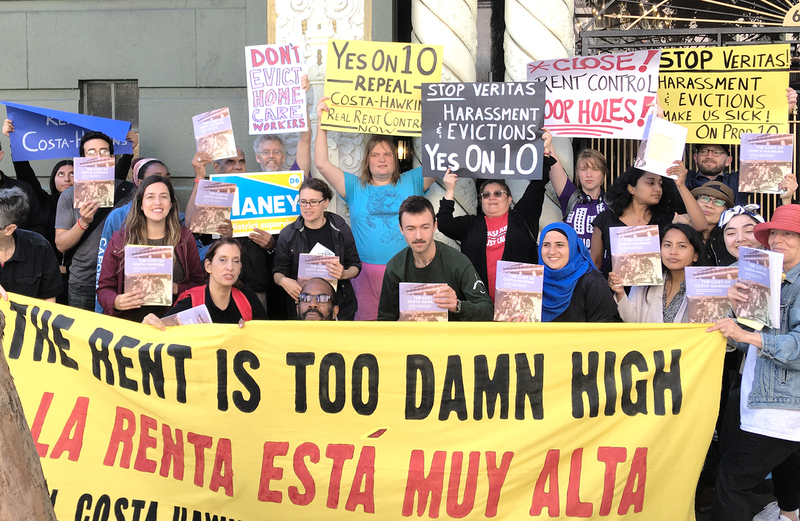 The rally was part of a statewide Day of Action for the Yes on Prop 10 campaign to repeal this state law that prevents local municipalities from passing real rent control. 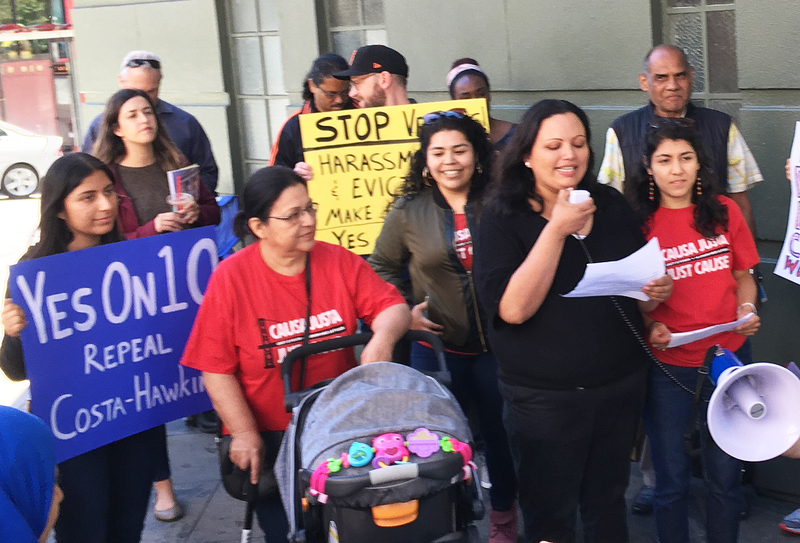 At the action, The San Francisco Anti-Displacement Coalition’s released our report “The Cost of Costa-Hawkins.” The report features stories of tenants facing massive rent increases, harassment from their landlords, and the loss of their longtime homes as a result of the law. Many impacted tenants shared their stories of struggling against impossible rent increases and harassment from their corporate landlords. Long-term SF resident Fe Soledad, who works as a caregiver, spoke about her struggle to stay in her Veritas-owned apartment. CJJC Member Cindy Salazar spoke about her family’s struggle to deal with a $1500 rent increase issued by their notorious millionaire landlord after 3 years of being displaced from their fire-damaged home. The Costa Hawkins Rental Housing Act is a state law that was passed by large real estate interests to limit rent control, after their efforts to fully repeal the popular protections failed. The law has succeeded in allowing rents to skyrocket, even in cities with rent protections, in part by banning vacancy control. This ban individualizes the benefits of regulations that could protect entire communities, ensuring that landlords can raise rents on units when the lease turns over, leaving subtenants unprotected, and incentivizing landlords to harass and push out long-time tenants. Costa Hawkins also restricts rent-control in San Francisco to multi-family units built on or before 1979. As a result, San Francisco has almost four decades of housing that has been left unprotected, and the rent control stock continues to be a shrinking portion of the total housing in the city. See SF Weekly’s coverage here.